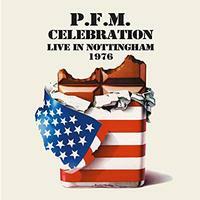 This double CD live album presents a classic concert from the 1976 incarnation of PFM. The recording quality is good for the time period, and the musicians really put in a potent performance. Personally I'm not completely sold on the vocals of this set, though. I'm not a big fan of vibrato in singing, and this is packed full of it. Even so, the instrumental work makes it worthwhile. If you like that kind of singing, you will probably have an even more positive experience here. This starts with the band being introduced and greeting the audience. Then some keyboards begin this. The vocals join after that at, but the music remains dropped back at first. The vocals get quite echoey. Eventually this makes its way to more rocking stuff. The mix leaves a bit to be desired, there, though. The guitar is so far up that it really takes control. That does manage to really elevate things later in the track for the smoking hot instrumental section that features both guitar and violin soloing in abundance. This fires out with some smoking hot fast paced prog jamming that is a lot of fun. There are sections of this that definitely make me think of Frank Zappa to a large degree. I like the instrumental sections of this track a lot. The vocals have too much of that vibrato at times, though. There are some moments of this that make me think of Peter Banks' post Yes act Flash. The cut works out to a very jazzy jam mid-track. Some world music creeps in on the extended instrumental track that serves as the center portion of the number. The lyrics on this are in Italian. The cut has a cool, mellower, jazzy groove to it. At the start it's basically just keys and vocals, but other instruments augment the arrangement as it continues. This guitar solo has some killer echoey texture to it, leaning almost toward space rock at times. It's not far removed from some of the stuff California Guitar Trio do these days. Of course, this pre-dates that by a long time. Acoustic guitar based, the first part of this is based on just guitar and voice. There is an echoey kind of element here. The cut gets into more of a rocking band arrangement further down and gets packed full of energy and style. A playful kind of hard rocking jam, there are hints of ELP, Frank Zappa and more built into this number. it's not one of my favorites here, but it has plenty of energy and works reasonably well. A bit of a drum solo opens this. They fire out into some killer fast paced jamming from there. It has a real fusion meets Rock In Opposition kind of vibe. As the vocals join, and the arrangement shifts, I'm again reminded of Flash a bit. There is another drum solo later in the piece, then flute or fife rises up to jam with those drums. As the arrangement fills back out there are some hints Celtic music, but it also works out to more of that Flash-like sound. This fast paced, rocking jam is another that makes me think of Flash quite a bit. It has some powerhouse instrumental work in a cool shifting and twisting arrangement. Again, the vocals aren't really my thing, but the instrumental work truly shines. A powerhouse jam, this has a real Italian prog vibe to it. The lyrics are in Italian. There is a dropped back movement that features a flute solo. The cut screams out from there with some incendiary jamming. The tune works to some almost jazz based jamming further down the road that's purely on fire. It also has a drum solo built into it. After that drum solo it works out to some particularly effective progressive rock that even makes me think of Yes a bit. The instrumental movement really makes this piece, and is the bulk of the nearly 15 minute length of it. This is one of my favorite numbers on this album. The powerhouse jam that opens this makes me think of Weather Report and Jean-Luc Ponty to a large degree. The violin really soars. There is plenty of fusion built into this. The violin takes control in a full-on solo further down the road. In fact, that violin solo, which eventually brings in the "William Tell Overture," makes up a major portion of this piece. The rest of the instruments return as they ramp that section up and it really becomes a powerhouse with definite ELP leanings built into it. The cut is another highlight here.